Sorry its been so quiet here this last week, Took a while to sort out my computer after another Windows Update messed a few things up. Hopefully back to normal this week! 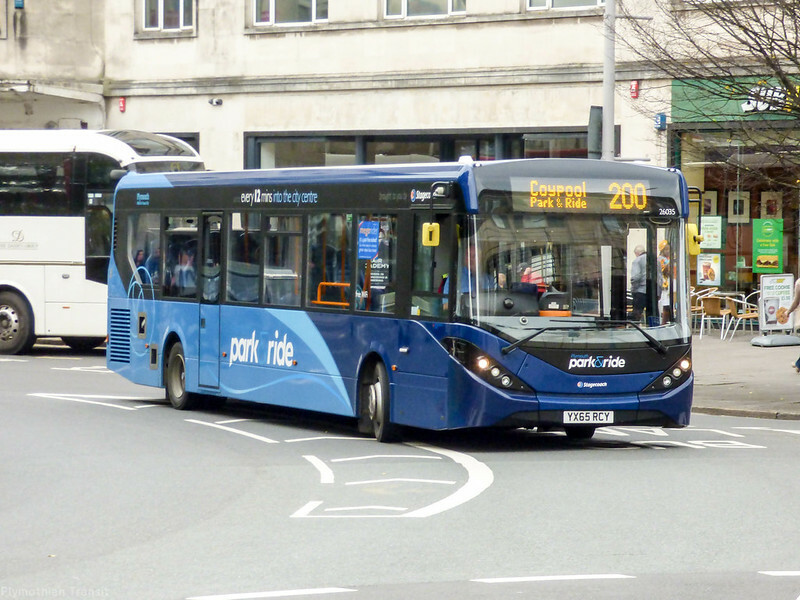 Stagecoach: new times for Park & Ride 200 with increased frequency on Saturdays. 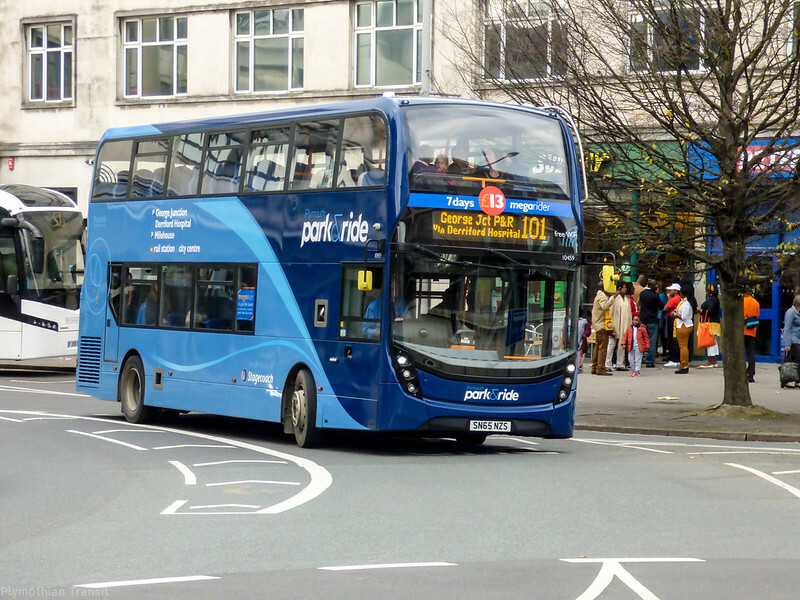 A new Sunday service for the Christmas period on the 101 and a new route into the city centre for the 1 from Tavistock. 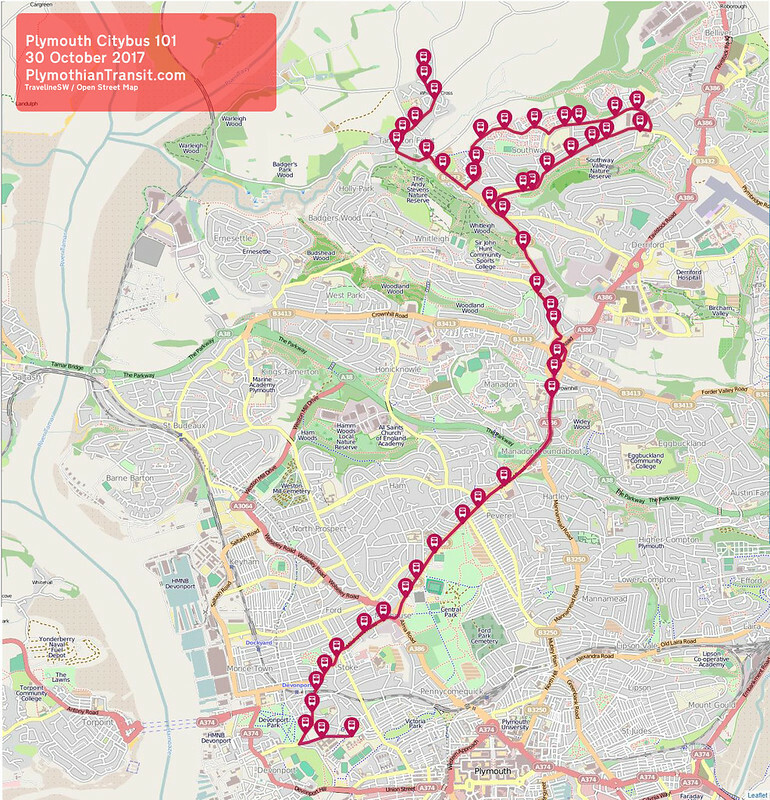 Plymouth Citybus make a couple of emergency service changes to school services 101/102 due to Derriford road works! 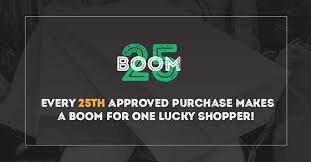 Effective: 20-Nov-17 - actually from 13th November! Due to ongoing reliability issues with the 101/102 school services, we are going to make an emergency amendment as from Monday 13th November 2017. This is due to severe delays we are experiencing in the Derriford area. We are fully aware that this is unlikely to completely resolve the issue due to the roadworks and unfortunately this will mean an earlier start for some of the students who use these services, but at this moment we have no choice but to make the services earlier to try and improve the reliability. 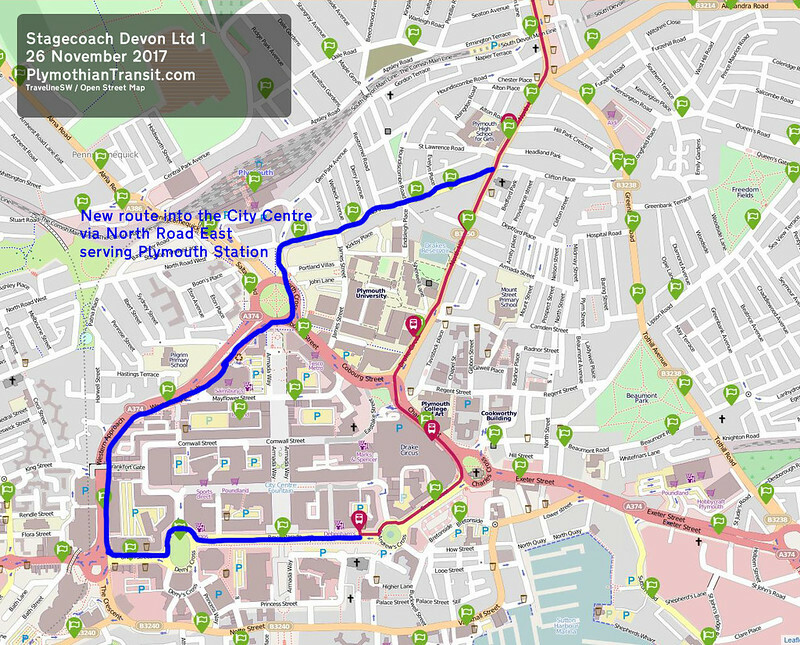 From 26 November we will be introducing an alteration to route 1 to improve access to Plymouth Railway Station. 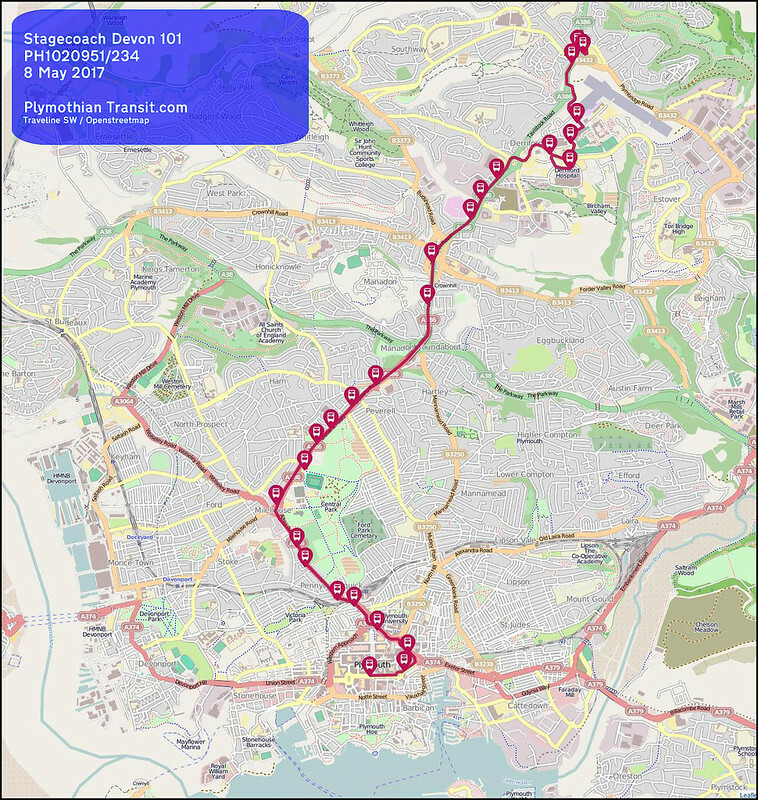 Buses from Tavistock will serve North Road East instead of North Hill, providing a much closer connection to Plymouth Railway Station. Customers who wish to travel from the station towards Tavistock will also need to board the in-bound service and then remain on the bus as it goes via the city centre and Plymouth University before heading back to Tavistock. Note that this is a new registration just for the seasonal Sunday operation. From the 26 November we are introducing a Sunday Park & Ride service operating on the five Sundays before Christmas. 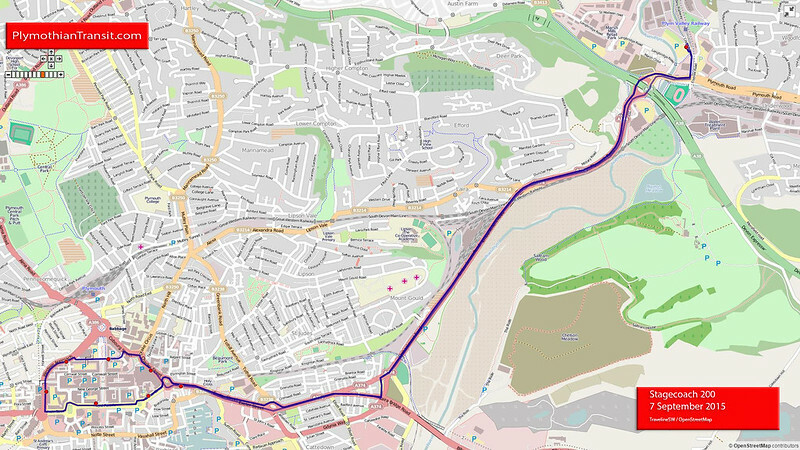 Buses will run from the George Junction and Milehouse (100/101) sites from just after 9am with the last service leaving the city centre at 5.30pm. There will also be an improved frequency on Saturday journeys on Coypool Park & Ride (200) however this will remain closed on Sundays. Stagecoach 1: Traveline's map has the inbound service running from the Station via Cobourg St and Mayflower St.
Hi Graham, I think your new map for the 1 is ever so slightly wrong as after the 1 serves North Road East, it will still serve Mayflower Street from what I understand. Thanks to all who have pointed this out. I will update the Maps shortly! ..... assuming Traveline is right, of course!